A new volume of the writings of Rabbi Yechiel Yaakov Weinberg, known as the Seridei Eish after the name of his volumes on Jewish law and the Talmud, authenticates details about his rabbinic ordination of the Rebbe, Rabbi Menachem M. Schneerson, of righteous memory, which took place in the 1920s while he was living in Berlin, Germany. The Seridei Eish is recognized as one of the 20th century’s greatest posekim, masters and decisors of Jewish law, who survived the horrors of the Holocaust. He combined a vast knowledge of Jewish law, an in-depth capacity to decipher many obscure sources and the ability to blend his encyclopedic knowledge of the sciences into his responsa. After World War I, the Seridei Eish relocated from Poland to Germany, where he wrote a thesis on the Masoretic text, the authoritative text of the Hebrew Bible compiled between the seventh and 10th centuries CE by a group of scholars known as the Masoretes. He later taught at the Rabbiner Seminar für das Orthodoxe Judenthum, the Rabbinic Seminary for Orthodox Judaism, also known as the Hildesheimer Rabbinical Seminary. The seminary’s goal was ambitious—to educate rabbis not only to be great scholars, but also to be personable and involved in the lives of community members. 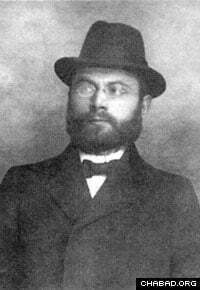 In 1926, the Seridei Eish became its rector and most well-known rabbinic figure. In December 1927, the Rebbe arrived in Berlin. During his first few months there, he continued his numerous detailed rabbinic correspondences with the great scholar Rabbi Yosef Rosin, known as the Rogatchover Gaon; and during his very first month there he wrote scholarly notes on a response authored by the Seridei Eish, titled Pinui Atzamot Meitim. That 57-page response was published by the seminary in 1926, and discusses at great length whether it is permissible for a family that has moved to another country to transfer the burial spot of their loved ones across the border. The Seridei Eish dissects all the Talmudic and subsequent works on Jewish law on this complicated issue. His response was widely praised by many of the great giants of Jewish law in pre–World War II Europe. The Rebbe’s private notes on the response, written in his very brief style, complete with many references, were found after his passing in 1994 and published as 19 pages in the Reshimot, volumes containing the Rebbe’s notes on many subjects, together with footnotes and explanatory text. The Rebbe, who was just 25 years old at the time, bravely disagrees with the Seridei Eish on several issues, including on one of the core issues of the various laws related to bizayon, “embarrassment,” as applied to things one should not do when it comes to one who passes away and is buried. The Seridei Eish opined that the reason for refraining from doing certain acts was in order to not embarrass the deceased. The Rebbe opined that it was in order to not embarrass the living. One example is the traditional clothing in which the deceased is dressed, known as tachrichim. At one point in Jewish history, people would be buried in the nicest garments they could afford; thus, the rich would be buried in nicer clothing than the poor. It was later instituted that the rich and poor should be buried only in linen. The Rebbe explained that this was not so that one should not embarrass the deceased, but rather so as not to embarrass the deceased’s living survivors, who might have been poor. Rabbi Avraham Abba Weingort, who heads the publishing house that prints the Seridei Eish’s manuscripts, recently said from his home in Jerusalem that he knows why the Rebbe wrote on this response; and he published the story behind it in his latest volume of the Seridei Eish’s writings on the Talmud. Rabbi Yechiel Yaakov Weinberg, known as the Seridei Eish. According to Weingort, after the Holocaust, his father, Rabbi Shaul Weingort, invited the Seridei Eish to Montreux, Switzerland. The venerated scholar lived in their home, and the son became very close with the rabbi. Professor Marc Schapiro, who authored a biography of the Seridei Eish, calls Weingort “the son that Rabbi Weinberg did not have,” and noted that he “is completely trustworthy” to record the story correctly. Weingort writes in his introduction to the volume that he heard this story from Rabbi Chaim Nachman Kowalski, who resides in Zurich and is a follower of the Gerrer Hasidic dynasty, and he was recording it word for word as he heard it from him. I would like to find this book of the Sridei Eish-can you give some details? By whom was this book published?